the improvement in the level of sun damage. Clinical photography is critical when undergoing cosmetic treatments because it monitors your progress. Photographs demonstrate the level of improvement achieved. Standardization of the photographs is very important so before and after pictures can be compared. For example, it is not a good idea to compare one photograph where makeup has been applied to one without makeup, as the one with makeup will almost always look better. Also, the skin will appear different depending on the lighting, so consistent lighting is important. Traditional photographs will demonstrate what is apparent on the surface of the skin. A new type of photograph used at A E Skin with the Canfield Visia imaging system is ultraviolet photography, or UV photography. Unlike traditional photographs, UV photographs will show skin defects that are deeper in the skin and are not visible by the naked eye. The most common defect is sun damage in the form of dark discolorations. 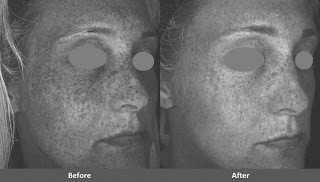 By taking UV photos before and after a treatment we can see the level of improvement achieved with the treatment. For a free consultation, contact Dr. Alex at 818-835-1833 or [email protected].